Mizuno FUTURES 13/15 Camp (Born ’03 to ’05) August 19th to 25th More INFO! The Big League Experience presents the Mizuno FUTURES 13/15 CAMP, August 19 to 25 in Oliver, B.C. This camp is for players born in 2003 to 2005 of all abilities who will be playing on an 80 ft/54 ft (Bantam) diamond. 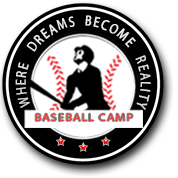 Throughout the week campers will be involved in skill development through individual specialty stations, intrasquad and tournament games. Team and positional play will also be a big of the daily schedule. Cost of the camp, including lodging, meals, BLE hat/shirt/shorts, coaching, instruction and supervision is $795 plus 5% GST.